Virginia Lee Burton, a dancer, designer, and print maker who lived and worked on Cape Ann, published in 1942 the Caldecott-winning “The Little House,’’ which featured charming illustrations of the passing seasons and a country house eventually caught up in and rescued from urban sprawl. Her books “Mike Mulligan and His Steam Shovel’’ and “Katy and the Big Snow’’ remain beloved as well. In celebration of the 75th anniversary of “The Little House,’’ children’s book author Sherri Duskey Rinker and illustrator John Rocco, have collaborated on “Big Machines: The Story of Virginia Lee Burton’’ (Houghton Mifflin Harcourt), a fresh and sunny look at Burton’s life and career. 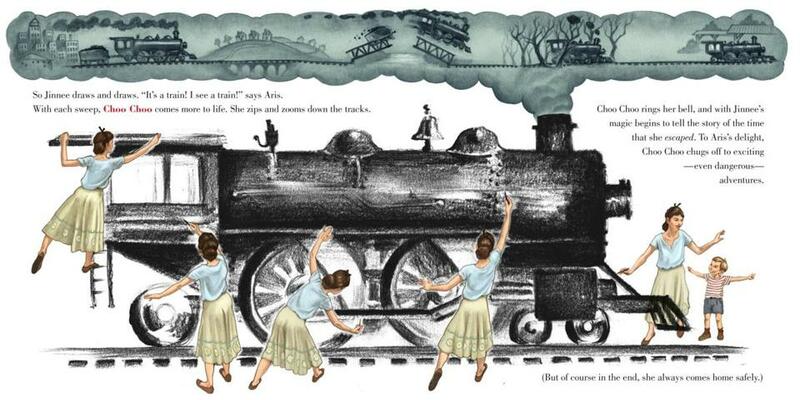 Rinker and Rocco show Burton as an enchanting figure, tending to animals, cultivating gardens, dancing, and creating characters out of machines (a train, a steam shovel, a bulldozer) for her young sons. Born in 1909, Burton founded a group called the Folly Cove Designers, a collection of women primarily from the North Shore focused on block printing, whose work can be seen at the Cape Ann Museum in Gloucester. One of Burton’s iconic prints, of a daisy chain that appears on the cover of “The Little House,’’ appears on almost every page of “Big Machines,’’ on the pattern on Burton’s skirt. The book is a warm and affectionate biography of a talented artist and lively spirit. Bright Leaf Books, a new imprint of the University of Massachusetts Press, will publish four to five books a year focused on New England — its culture, landmarks, history, food, and flora. Their inaugural title, due out this month, is Beth Luey’s “House Stories: The Meanings of Home in a New England Town,’’ which explores notions of home through the histories of a series of historic houses in Fairhaven, Mass. Forthcoming titles include “Bricklayer Bill: The Untold Story of the Workingman’s Boston Marathon’’ by Patrick L. Kennedy and Lawrence W. Kennedy, which tells the story of the two men’s uncle, Bill Kennedy, who won the marathon in 1917, and “Concrete Changes: Architecture, Politics, and the Design of Boston City Hall’’ by Brian Sirman, which looks at the loved-and-loathed building. Nina MacLaughlin is the author of “Hammer Head: The Making of a Carpenter.” She can be reached at nmaclaughlin@gmail.com.